Greetings from beautiful Mendoza, Argentina. 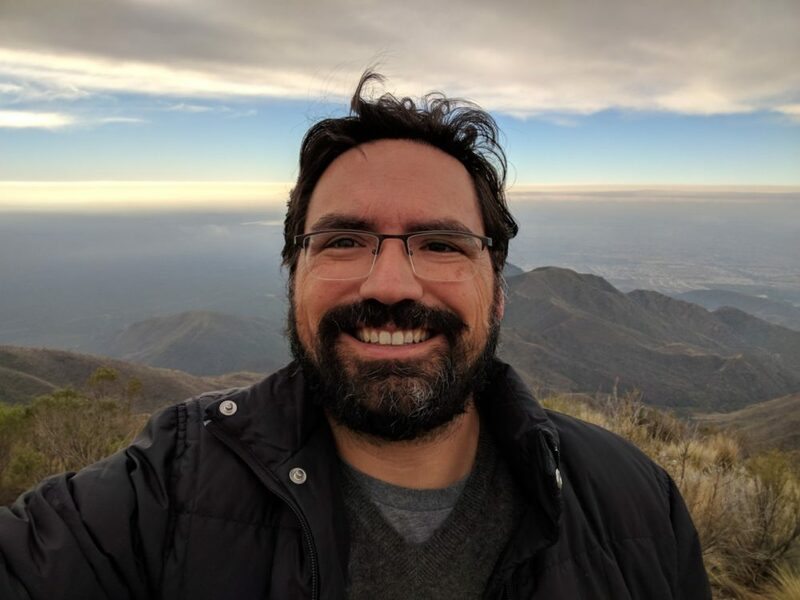 Last year I gave you my six best travel hacks and showed you how I got my $1,800 flight to South America for free. In today’s post, I want to teach you three techniques to help you be smarter and have more fun while seeing the world. Europeans are better travelers than we are and they know you can’t travel properly with a roller bag. After watching enough of them, I recently made the switch to a backpack and I will never go back. I am now so much more mobile and can navigate the bumps, steps, and tight airports with ease. After reading dozens of reviews and watching countless YouTube reviews and packing recommendations, I decided to purchase the Osprey Farpoint 40 Travel Backpack. It has 4.5 stars on Amazon with 300 reviews and I can’t recommend it enough. It has a small metal frame and the hip and chest straps help distribute the weight. When you go on epic trips like a European, you will take several trains, buses, and planes. When you are on the move every few days, you have to pack light. 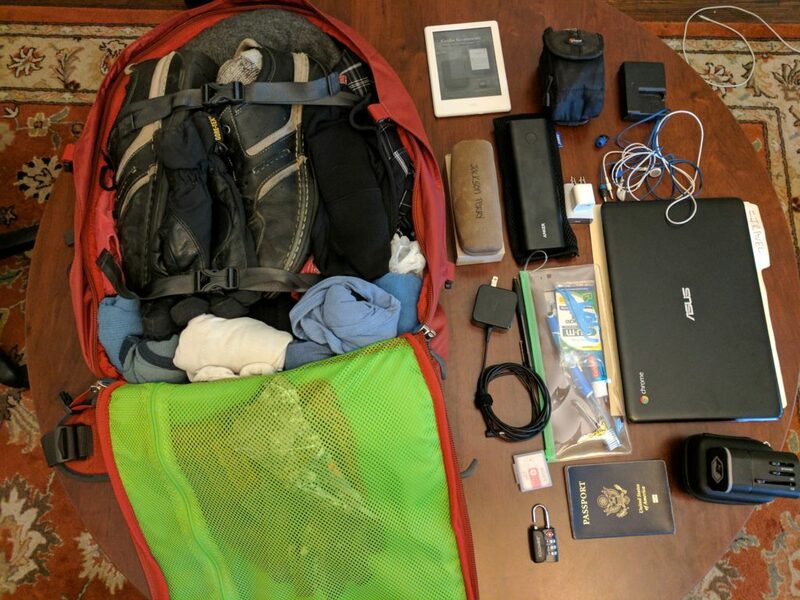 On my current trip I filled my bag with: 10 pairs of socks and underwear, 7 shirts, 2 shorts, ski pants, 1 sweater, 2 gloves, a pair of shoes, toiletries, a Chromebook, a camera, a kindle, and the related chargers. As you can see in the photo below, I got all this stuff into one carry on bag. This saves me checked luggage fees and makes my life so much better when I have a hotel checkout at 11 and I don’t have a place to store my bag until the next hotel check in or an evening flight or bus. If you are in the market, consider a carry on back pack instead of buying your next roller bag and get a take a little European swagger on your next quest. In addition to learning about the world and trying new experiences, travel gives you an easy opportunity to talk to people that you would ordinarily not come into contact with. I have eaten kangaroo with an Aussie dog sledder in Frankfurt, discussed the intricacies of German special needs hiring and firing with a business owner in Cancún; and last night I had a terrific conversation with a Swiss, Brit, Brazilian, and American. By the way, did you know you can walk into a government office in Switzerland with a pound of cocaine and they will test it for you for your safety and not follow you home and arrest you! You have been given an enormous gift: the ability to speak English. People from all over the world speak good English and it often becomes the default language when groups of people speak multiple languages. My first technique for meeting people abroad is to sign up for tours. You will often be in tight conditions with six to ten people for an entire day sharing the same new experiences. Tours are also usually an economic ways to see sites outside of the walkable area you are staying in. The second strategy for meeting interesting world travelers is to look for another couple if you are a couple or someone alone if you are alone and muster enough courage to say hello. You are playing the percentage game and this will unfortunately cause some occasional rejection. It is not you; brush yourself off and move on to your next future friend. The “yeses” more than make up for the awkward misses. Two nights ago I was seated next to an Argentinian shoe wholesaler in his 60s. I took a risk by striking up a conversation with him and we ended up having a great time for the next hour and half that ended with a big kiss on my cheek. I didn’t know that was a thing here and you can bet that I will not be forgetting that surprise. My last tip on how to conquer world travel like a European is a little out there, but it is so good it needs its own section. Whatever youth hostel you are imagining does exist, but fortunately there is the Hostel World App to help you find the right fit. I am 39 years old and would not normally hang out with a bunch of people in their 20s, but while traveling, it is a blast. The things you learn and the shared experiences enhance your trip in so many ways. Prodigious Accumulators of Wealth (PAW), like myself, choose not to spend tens of thousands of dollars on an epic trip. If you are going to stay on budget, there are only four levers you can pull when it comes to travel: eating, activities, transportation, and lodging. Each person will have to rank their own priorities, but I side with the six sigma black belts of travel: Save on lodging and splurge on the fun stuff. My ski tour was $150 for a day of skiing in the Andes. I signed up for a $100 paragliding session today. World class activities add up over the course of a several week trip, especially when you are paying for the entire family. When you add in the typical $150 night hotel that many Americans are accustomed to, most people are over spending and harming their ability to retire and pay for their children’s college. A great solution that saves you money and usually enhances your trip is the Hostel. The easiest way to get started is to book a single bedroom with a shared bathroom for your trial run. This experience will be a lot like a hotel and give you a chance to meet interesting travelers in the common area. You will likely find that it is better than you thought it would be, especially with the $100 you saved. I recently stayed on one of the most desirable streets in Santiago, Chile for only $25 per night for my own room and a decent breakfast. 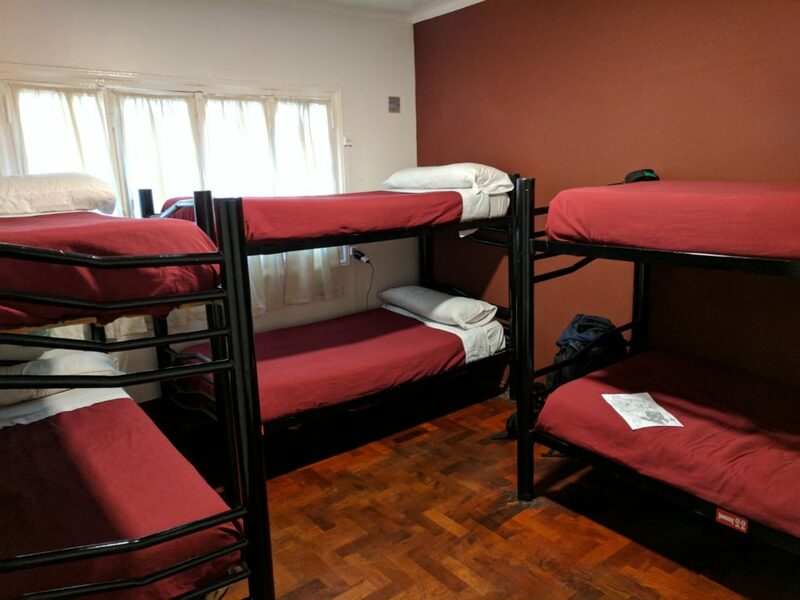 Many hostels have four beds in one room where you can stay close to the action with your family and stay within your budget. If that experience goes well for you, I encourage you to take the uncomfortable leap of having a shared bedroom. Sharing a bedroom with total strangers is awkward the first time, but it makes it super easy to meet interesting people that are probably looking to do the same activities as you are that week.. Many Europeans continue their travels with people they met at a hostel. Below is a picture of my $12 per night six sleeper room. This room was a smashing success. Four of the other five people are terrific and were looking to have fun with new friends and our stays mostly coincided with each other. Sometimes you hit a grand slam and sometimes you strike out. 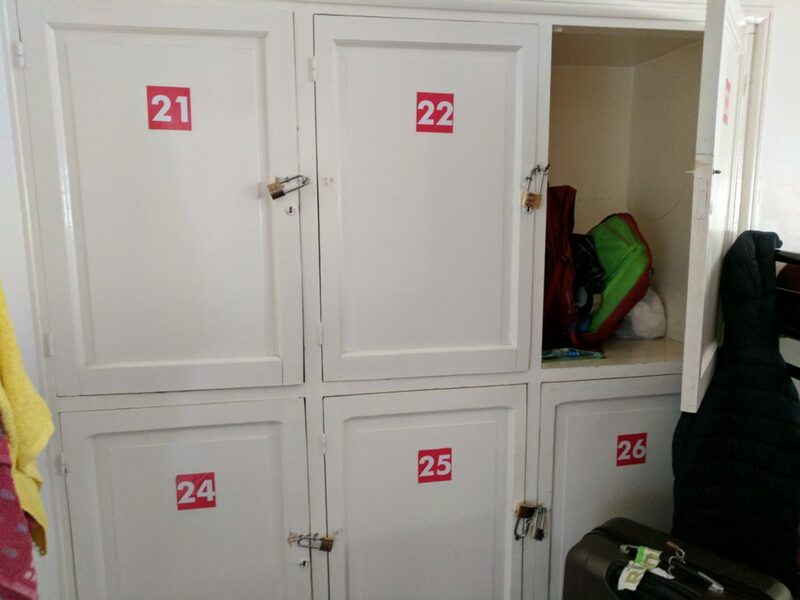 Most hostels have storage lockers in the rooms like the ones pictured below. The door to the room doesn’t lock, but you can safely store your belongings behind a padlock. Each of our beds has its own charging station for electronics. The Osprey Farpoint with too much space in locker 23. In addition to saving you serious money and making it hard NOT to meet people, hostels are usually staffed with terrific people that are expert travel agents. They know all the activities and restaurants and can usually book tours directly for you. Instead of paying for a $140 winery tour yesterday off Trip Advisor, my hostel had detailed instructions on how I could take a 30 minute bus ride to the Maipú Wine Region where I had a free bike rental and I had a terrific day seeing four vineyards for only 351 Pesos (about $21). There you have it. If you dare to ditch the wheely bag, strike up conversations, and try out hostels, you too could practice the European art of better travel. I am off to dinner with a guy I just met from Singapore. Hasta luego.